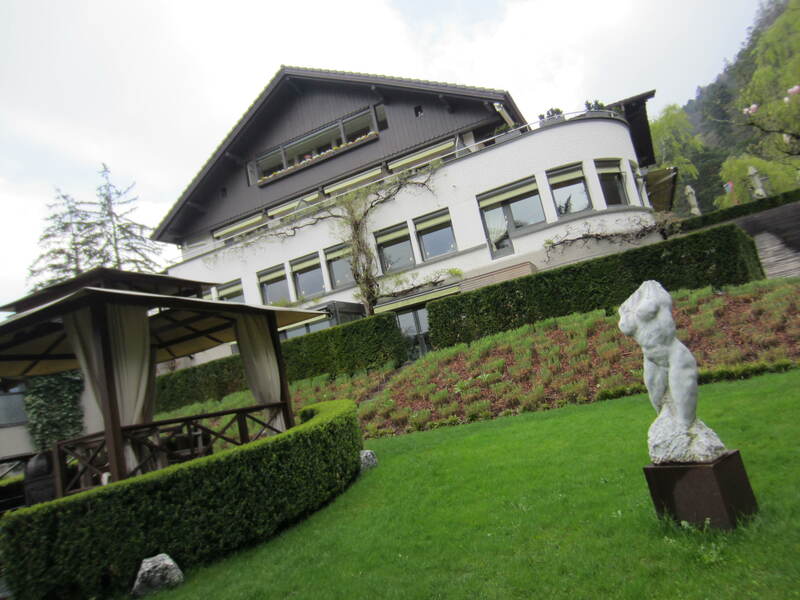 MARVELLOUS hospitality, service of the highest standards, and most excellent gourmet delights of food and wine in Relais and Chateaux’s Parkhotel Sonnenhof...high up in the mountains of the Principality of Liechtenstein. I arrived here in the evening to find a secluded hilltop hotel resort shrouded by mysterious clouds and swirling mist. It was raining heavily and a trifle chilly. Brought to my suite…I found a most comfortable and well appointed residence…right out of Lifestyles of the Rich and Famous. 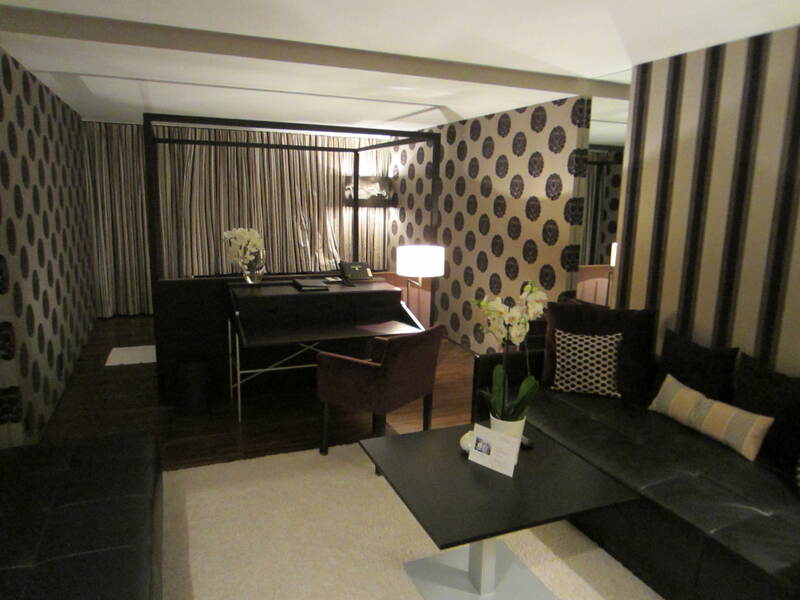 Tastefully furnished in a combination of Beaux Arts and Art Deco styles with black and white highlights. I checked my Swiss personal Altimeter..I was 525 meters above sea level. 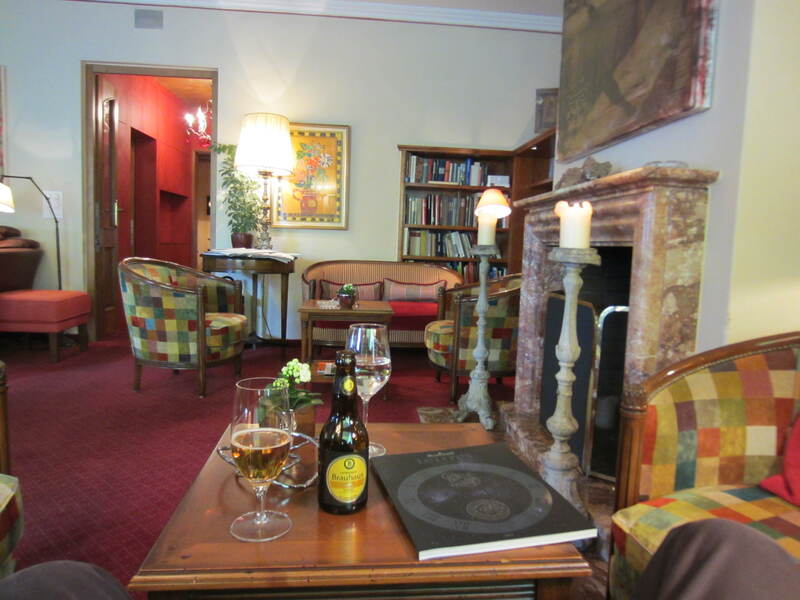 In the cosy and tranquil Salon that is also a Library, You can relax and enjoy a glass of Leichtenstein Brauhaus beer which has a resemblance to Singapore’s Tiger beer. The smooth beer is light and refreshing on a warm Spring day. Brauhaus beer is the light and refreshing beer of this tiny but fascinating country that is Leichtenstein. I checked with my personal Altimeter which read 525 meters ASL. From the hotel you can enjoy a superb and inspiring view of mystical Schloss VADUZ which is the home of the Prince of Leichenstein. Every time I see das Schloss Vaduz (Vaduz Castle) I am reminded of that Comedy Action Thriller movie called “The Grand Budapest Hotel”. Near the Reception is a Wall of Fame with photos of many VIPs who have stayed here including Ban Ki Moon, the Secretary General of the United Nations and the Queen of Belgium. 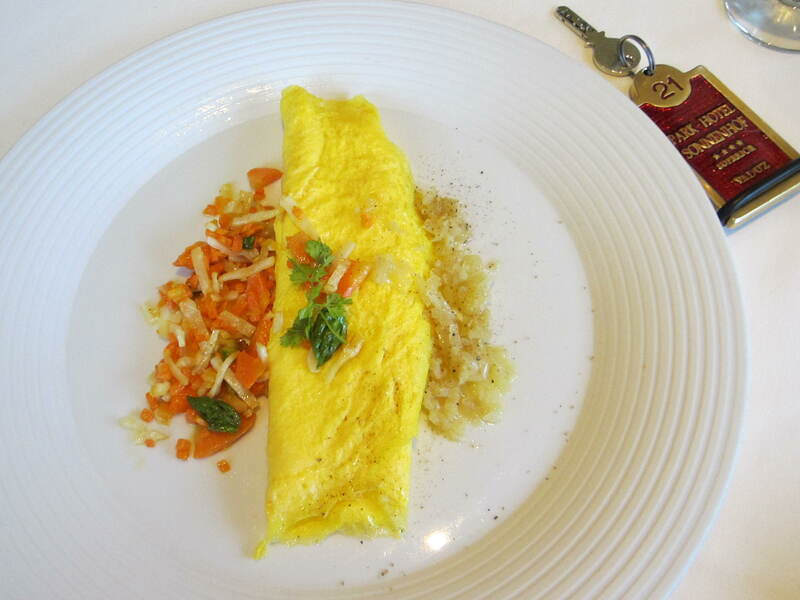 Fruehstueck or Breakfast is a gourmet’s delight here. From freshly squeezed Orange, Grapefruit and Tomato juices to a lovely selection of assorted Cheeses including Swiss and Leichtenstein varieties, Proscuitto, Salame, Ham and more…Cereals & Muesli with Pumpkin Seeds, Figs, Fresh Strawberries, Apricots, Dried Mango, Prunes, Pear, Pineapple…you are spoilt for choice. 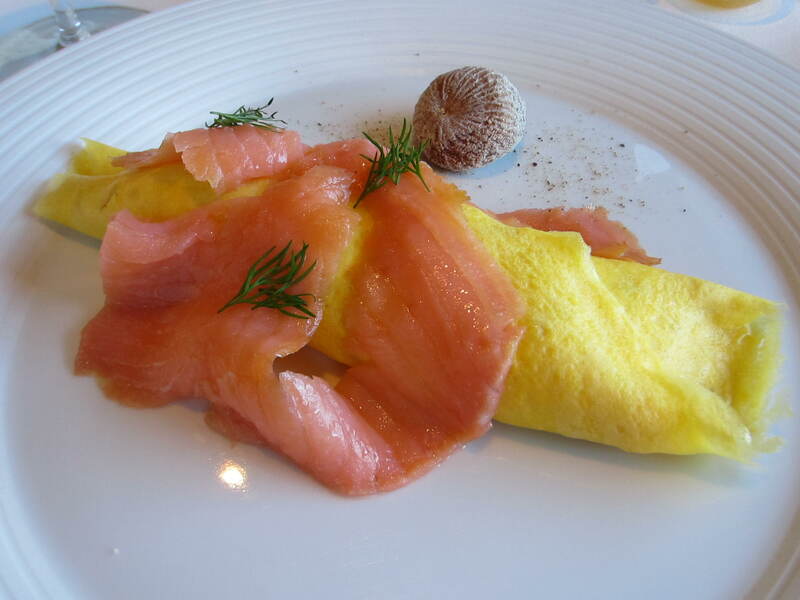 J’adore the Salmon Omelette with Onions Brunoise and its soft moist center served a la minute to your order. The Spanish Omelette is also super yummie! Most satisfying….Other tempting Breakfast treats include lovely wholemeal Croissants, Butter Croissants, Danish Pastries, the uniquitous Pain au Chocolat, Roggenbrot (Rye), Farmer’s Loaf and more…My favourite table is in the far corner by the colourful stained glass window…where I have a panoramic view of the majestic snow capped Swiss Alps basking in the bright morning sun framed by powder blue skies! 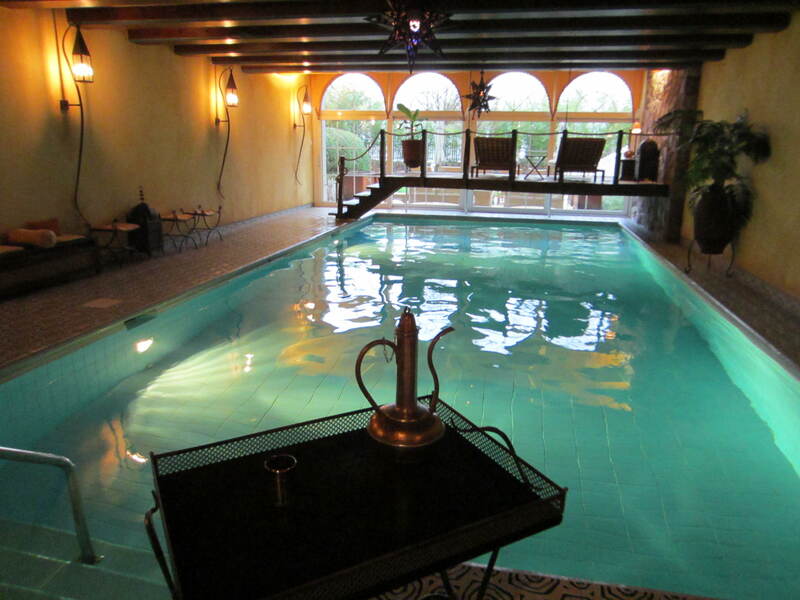 The tranquil heated indoor Moroccan style swimming pool is really excellent. Moroccan decorations like copper coffee pots provide a unique ambience. After all the food and wine tasting as The Travelling Gourmet TM, I make it a point to exercise daily. I really enjoyed swimming here tremendously every day of my stay. The pool is about 18 m long and 1.3 m deep. You can put in some serious laps here, as well as practice Krav Maga in the water. There is also a 90C Pinewood Sauna and a Steam Room. In between swimming you can snack on healthy dried fruits like raisins, banana chips, prunes and guava plus imbibe premium Peppermint or Spiced Chai Tea by Ronnefeldt of Germany.. 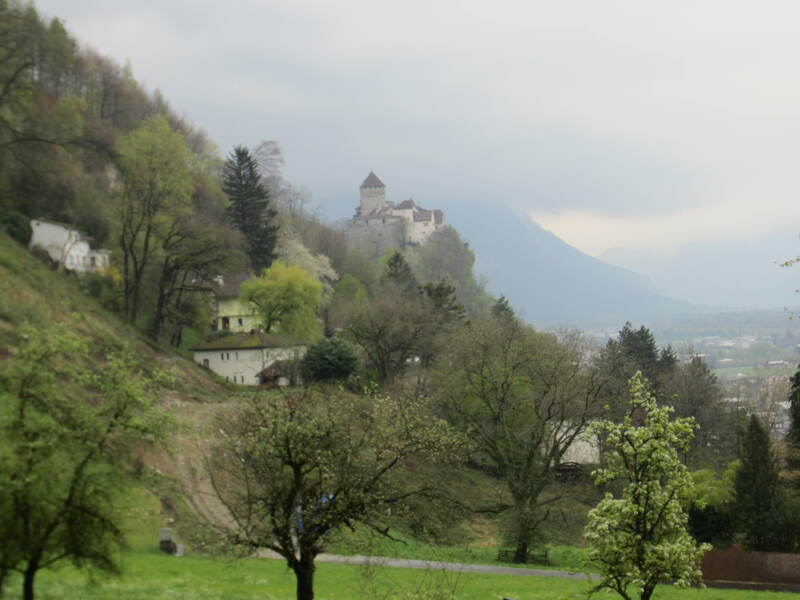 In the morning I trolled down to the town center and I did a tour of Vaduz. It took 20 minutes to walk down to the city center along narrow winding roads. Vaduz is not big. 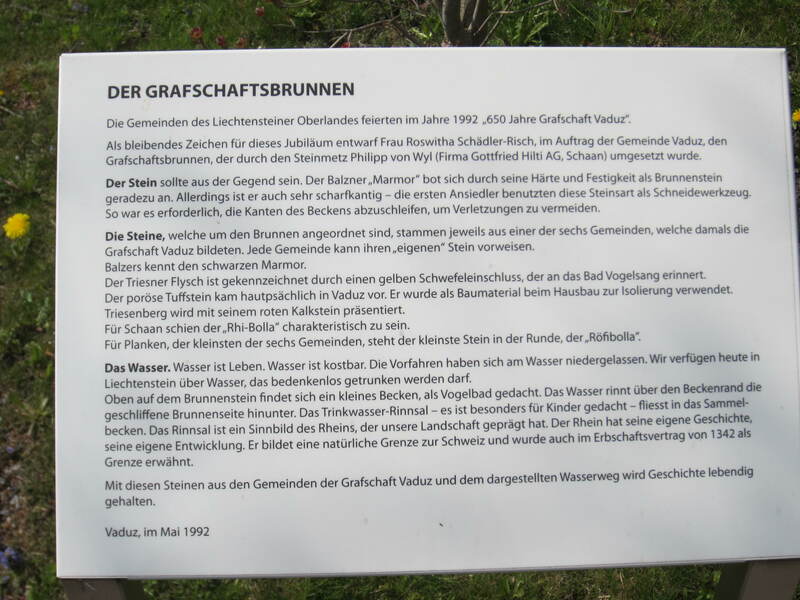 You see, Leichtenstein has a population of just 37,000. The land area of 160 km2 is about one quarter that of Singapore! Not many places in the world are smaller than Singapore! I took their City Train City Tour. It is not really a train but a motorised train-like vehicle with carraiges. After a satisfying lunch of Hungarian Gulaschsuppe at Lett Restaurant and Bar in Vaduz, I made my my way back to the hotel. 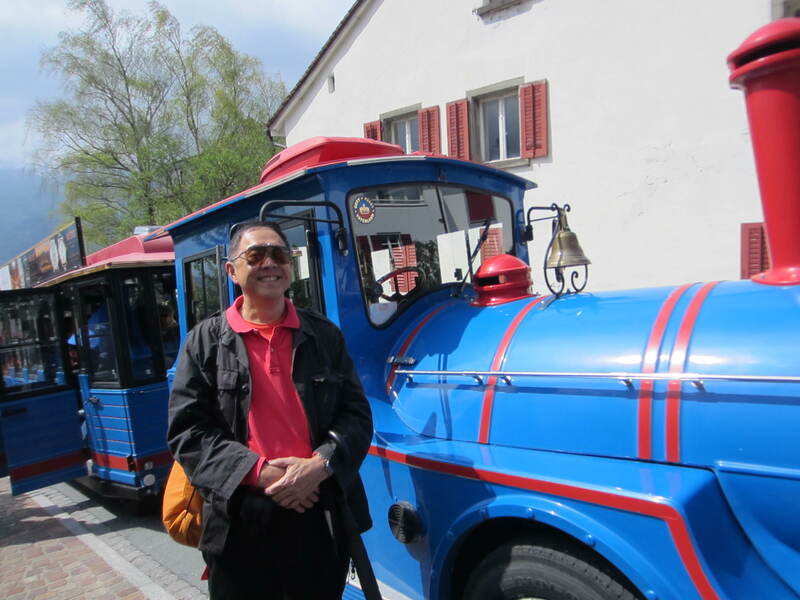 I felt good to have a good walk back to the charming Parkhotel Sonnenhof and burn some Calories enroute. It was a beautiful day with powder blue skies and fluffy white clouds floating effortlessly without a care in the world. Near the Grafschaftsbrunnen which is a drinking water fountain, I was lucky and pleased to meet a Winemaker who also happens to be a Banker. Tonight I had the most delicious and fabulous 8 course dinner specially prepared by Chef Hubertus Real. Creative Chef Hubertus is the son of Emil and jolly Jutta Real who own Parkhotel Sonnenhof. To dine well while watching the sun slowly set over the Swiss Alps and majestic Schloss Vaduz is bathed in shades of rose is something to always remember. Here, well presented outstanding food like flavoursome Sous Vide Wild Salmon on a Ragout of Mango from South America is impeccably served! A trio of most appetizing soups…Spargel or White Asparagus, Carrot and Wild Garlic! The moist and tender Veal Filet was also marvellous…surrounded by a clear Consomme of fresh Spring Vegetables like Tomatoes, Mushrooms and Leeks…With each superbe course, wines from Leichtenstein selected by the Italian Sommelier Jacopo from Milan. It was a dinner to rob a bank for! Somehow, despite all that delicious food…I did not feel overly full or bloated at all. 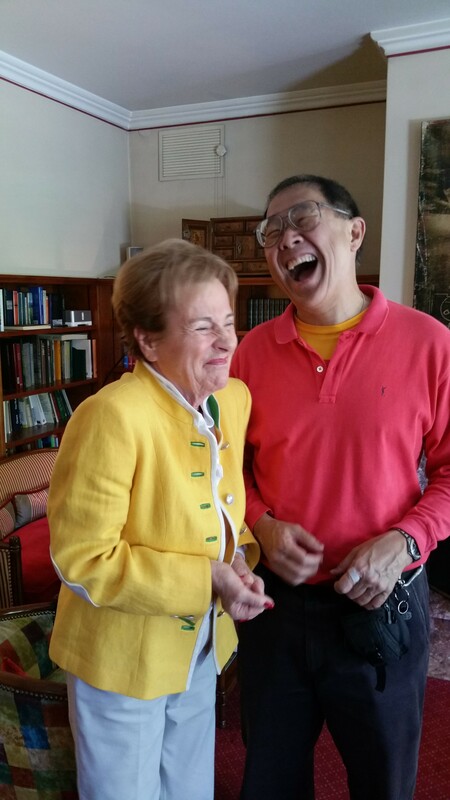 A testimony to a great Chef whose cusine is extremely flavoursome, yet light and not stodgy. Restaurant Maree has one Michelin Star! 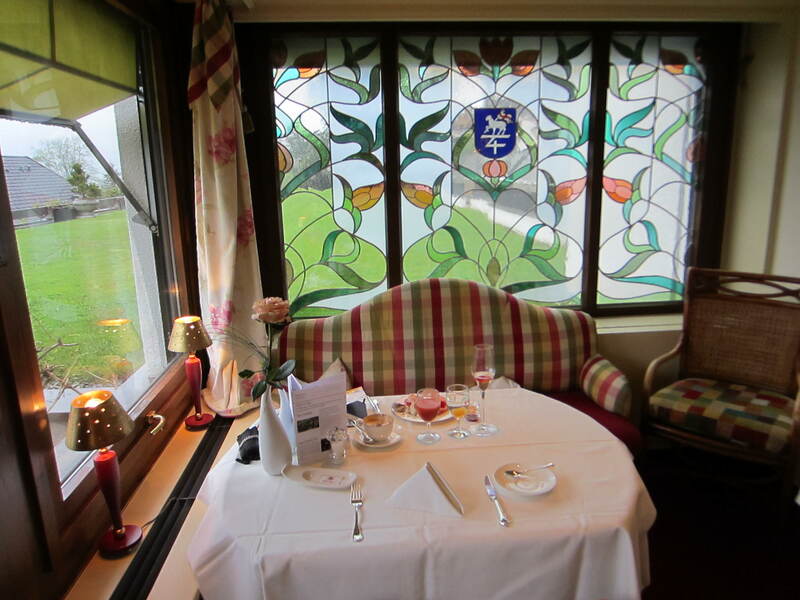 I must return soon…I hope Chef Hubertus gets a second Michelin Star next year. It will be well deserved! Always be good to yourself because life is short. This entry was posted in Art, Castles & Museums, Chocolates & Desserts, Fabulous Food, Fabulous Food and Gorgeous Drinks, Friends & Comrades, Gorgeous Wines!, Gourmet cuisine, Organizations, Philosophy, Travel, Wine Appreciation and tagged Adrian Dill, Chef Hubertus Real, Chinese Tourists in Vaduz, Dr. Michael Lim The Travelling Gourmet TM, Michael Buble, Nina Simone, Parkhotel Sonnenhof, Principality of Leichtenstein, Real family, Relais and Chateaux, Restaurant maree, Switzerland, Vaduz Leichtenstein, Zuerich. Bookmark the permalink.